Nearshoring or reshoring – the transfer of manufacturing from remote centers to locations near end markets – is coming to the food business, but in a form that is much closer to home. Increasing consumer demand for fresh foods is supporting a shift to sourcing product from local growers rather than mega-producers thousands of miles away. Of course this is not a new idea; before the age of mega-farms and agricultural conglomerates communities were served by local farms. But this is far from a return to bucolic scenes of farmers trundling to community markets laden with vegetables. Today, concerns over food quality and security and an increasing consumer appetite for fresh produce are driving the need for shorter, more responsive food supply chains. The basic idea is well known in supply chain management circles. Moving production closer to end customers cuts the cost and complexity of transportation, and makes supply chains more sensitive to changes in local demand. Compressing the supply chain in this way also reduces risk; a major consideration today as companies are exposed to threats such as adverse weather (brought home by California’s drought-hit agricultural industry), price volatility, and economic uncertainty. Environmental concerns represent another major driver. A shorter supply chain usually has a smaller carbon footprint, and can reduce the need to treat produce with chemicals to prevent spoilage during long transits. Consumer unease over mega-farm production practices also feed the locally-grown movement. 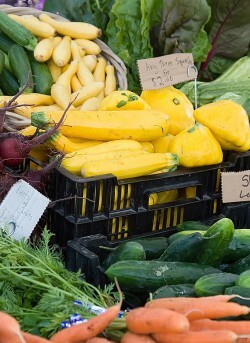 Farmers markets have enjoyed something of a renaissance over recent years on the back of these trends. Although these entities are still important outlets, their growth has plateaued somewhat. Farmers can find it costly to participate in these markets. Food hubs, on the other hand, are on the rise. These are enterprises that collect, distribute, and market foods supplied by local and regional producers. Their target markets range from institutions such as schools, to restaurants and retailers, and underserved communities. The National Good Food Network’s (NFGN) 2014 Food Hub Financial Benchmarking Study estimates that there are more than 300 food hubs operating around the US, and almost half were less than five years old when the study was carried out. One of the hubs looked at in NFGN’s benchmarking study is First Hand Foods, which supplies product from more than 60 farmers in North Carolina to restaurants, institutions, and retail grocery co-ops. First hand was profitable, and generating annual sales of around $1.25 million. According to NFGN, the highest performing 25% of food hubs posted a 4 percent profit compared to the average of -2 percent. The most profitable entities were larger, older, for-profit hubs. Some entities have diversified, for example by offering specialized logistics services. “Sustained profitability for regional food hubs is critical to the emergence of this new force for community economic development throughout the United States,” states NFGN. The jury is still out on the long-term viability of food hubs, but as the model matures there is much optimism that they will become an important force on the fresh food business. Another way to shorten the supply chain from field to table is to bring the farm to the supermarket. This is basically what BrightFarms Inc. does, a New York City-based company that develops, builds, and operates greenhouse farms at or near supermarkets. BrightFarms runs a state-of-the-art greenhouse facility in Yardley, PA, that supplies McCaffrey’s, a local supermarket chain, with lettuce and herbs all year round. The 56,000 square-feet greenhouse was inaugurated in 2013 as part of the grocery industry’s first long-term Produce Purchase agreement. The company also operates a 100,000 square-feet greenhouse in Kansas City, MO, and is building a 120,000 square-feet facility in Elkwood, VA. The latter farm will serve the Washington DC and Potomac metro areas for retail partner Ahold. Environmental stewardship and energy conservation are central to BrightFarms’ business model. Earlier this year it announced an agreement to source all of the energy used in its Yardley greenhouse installation from wind power. It’s unlikely that the locally-grown phenomenon will put many large, established producers out of business. However, it does open up opportunities for new supply chain models and logistics services. And the demands that are driving shorter food supply chains are indicative of broader changes in consumer buying preferences.